The Ernabella ceramic studio brings young men and women into the studio to produce work alongside senior artists. Over the past few years the ceramic artists of Ernabella have taken their skills to new heights, with some participating in artist residencies at Jam Factory, Adelaide and Jingdezhen, China, and others mastering new forms and designs. The artists have exhibited in high profile exhibitions across Australia, most recently in the 2015 Australian Ceramics Triennale, the 2016 Australian Ceramics Association’s Biennale exhibition OVERUNDERSIDEWAYSDOWN for cutting edge ceramics in Australia, as well as annual exhibitions at Sabbia Gallery, Sydney. 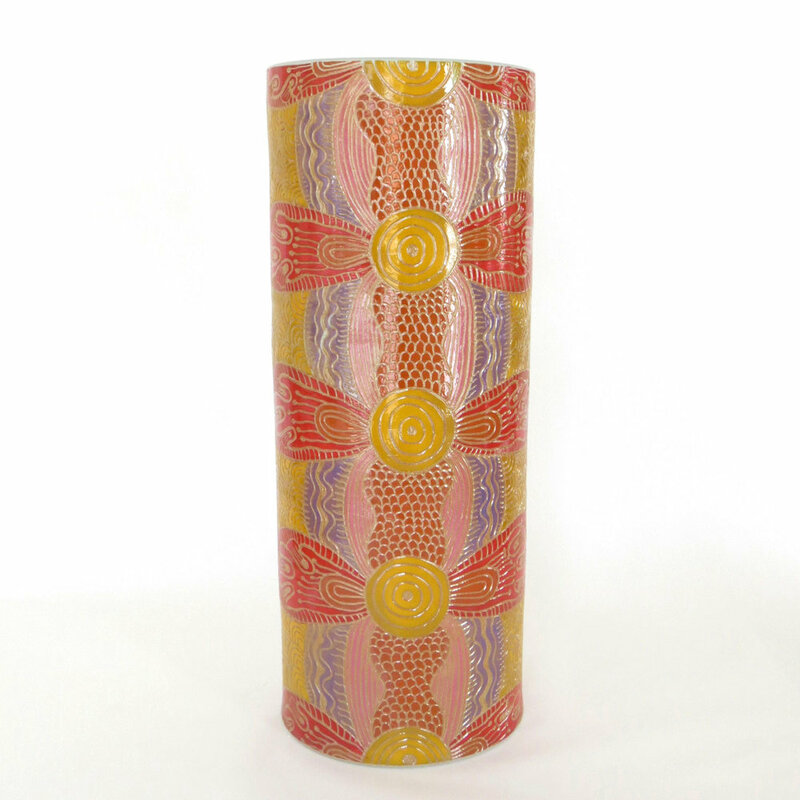 Ernabella Women’s ceramics are renowned for their intricate designs and patterning, refined through mastery of sgraffito – where designs are etched bask into the painted surface, or into layers of slip. Milyika is a strong leader and excellent spokesperson for Anangu Pitjantjatjara artists. She was Anangu Mayatja (Manager) at Ernabella Arts 2004 - 2007, Chairperson of Ananguku Arts and Culture Aboriginal Corporation (Ku Arts) 2004 - 2006, and is currently Director of Ananguku Arts. Alison was Chairperson of Ernabella Arts from 2007 - 2010. Her husband, artist Pepai Jangala Carroll, has also held this important title. Milyika's walka (design), shown in the fine lines of this work, reflects her identity as a contemporary and senior Pitjantjatara woman. 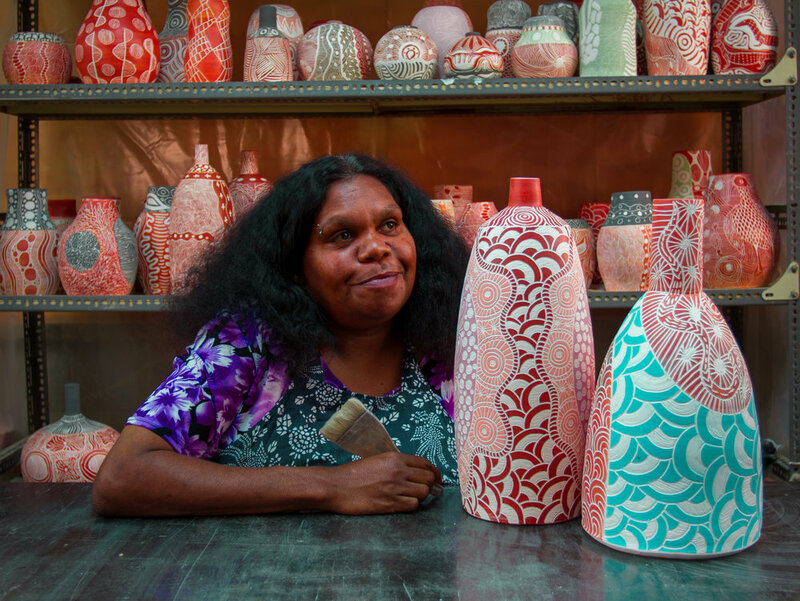 Lynette is fast becoming one of Ernabella's leading young ceramic artists. In this work she paints the Tjala (Honey Ant), a story told across the Northern Territory into South Australia. Tjala, like many other animals across the APY Lands, is an important link between mythology and interdependence with the environment. Tjala are found about a metre underground beneath Mulga trees. When the Pitjantjatjara seek Honey Ants they look for the drill holes under the trees. When they see them, they shovel and dig down following the tunnels to find the Honey Ants inside. Honey Ants are a highly favoured food source, with the honey-like liquid sucked from its abdomen. Janelle works alongside other women of her generation in the ceramics studio at Ernabella Arts in Pukatja. Her grandmother, Carlene Thompson is a celebrated ceramic artist. Janelle's grandfather was one of the leaders of the APY land rights movement. In mid-2016 Janelle worked alongside seven other Ernabella women potters to create a collaborative ceramics installation for the Indigenous Ceramics Art Award at the Shepparton Art Museum, Victoria in August 2016. Ngayuku Walka means 'my design' and artists often use this to describe paintings that are pattern-based rather than descriptive or story-based. Ernabella women are renowned for their intricate walka, often used on various different mediums. Carlene started working at Ernabella Arts in 2007 and quickly developed a very individual artistic style. Her designs are original and contemporary while being often based on Country and the creation beings of her family's country. She is a strong participant in women's ceremony and has passed this knowledge down to her daughters. Carlene has also held the position of Chair of Ernabella Arts and is on the Board of NPY (Ngaanyatjarra, Pitjantjatjara and Yankunytjatjara) Women’s Council. This work is about birds and their chicks. Carlene often paints birds, as Tjulpu Tjukurpa (Bird Dreaming) is related to her home country. As a mother of several children including four daughters, family themes are common in Carlene's work. Following recent heavy rains, the sand dune country to the north of Ernabella came to life with new growth of grasses and wildflowers. Anangu Pitjantjatjara have a word for this - Inuntji, which means fresh plant growth, which also refers to the time of year when flowers blossom, after the summer rains. The arrival of flowers indicates abundance and that various bush foods and medicines will now be available.